The Superfund Green Q-AG is the flagship managed futures fund that has utilized the Green managed futures trend-following strategy since inception on March 8, 1996. In the past decade, investors have experienced several periods of volatility and market stress, learning that years of profits can be wiped out in a few months. Managed futures strategies seek to reduce overall market risk in a diversified portfolio. Superfund funds have the ability to profit in all market conditions, regardless of rising or falling prices. * Superfund Green Q-AG (closed fund); Performance results are net of fees (excluding upfront fees and taxes); time period: 03/1996-02/2014; source: TeleTrader; logarithmic scale. 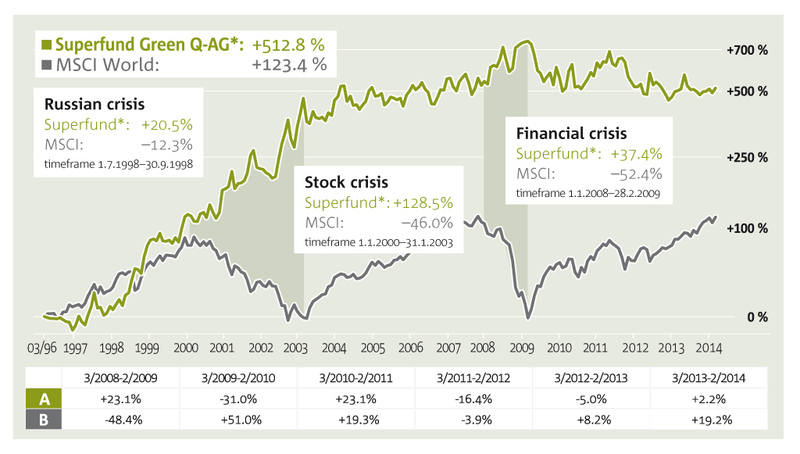 Past performance of Superfund Green Q-AG is not indicative of future results of Superfund Green Q-AG or any other Superfund funds. Superfund products are speculative investments. A complete loss of the principal invested cannot be excluded. 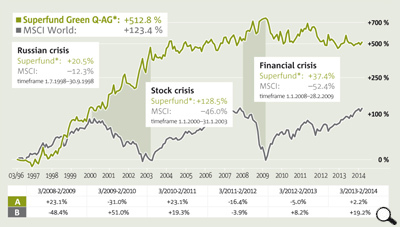 The Superfund Green Q-AG* returned an impressive 512.8%* (+10.6% pa) since inception in March 1996, while the MSCI World returned 123.4% (+4.6% pa) for its investors in the same period. Past performance of Superfund Q-AG is not indicative of future results of Superfund Q-AG or any other Superfund funds. Superfund products are speculative investments. A complete loss of the principal invested cannot be excluded. Superfund Q-AG, closed fund; Past performance of Superfund Q-AG is not indicative of future results of any Superfund funds. Notice: Superfund products are speculative investments. A complete loss of the principal invested cannot be excluded. Fees of the Superfund A Strategy are higher than that of the Superfund Q-AG. Drawdowns may occur any time and may range approximately from 20–30 % from the respective all-time-high. Decreases in value exceeding these figures are also possible at any time, also a complete loss of the principal invested cannot be excluded.